Emily Ambrosino is the Dean of Teaching and Learning at Mercy High School. 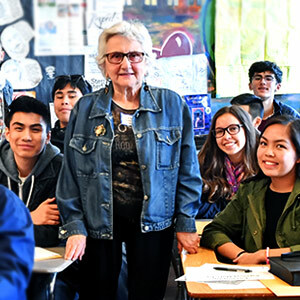 Her work with Holocaust education and service learning has focused on teaching students how hope and action during the darkest moments of history can bring out the best of humanity. Nanor Balabanian’s four great grandparents were among the few to escape the Armenian Genocide. After immigrating to the U.S. when she was 15, Nanor earned a BA in Political Science and a MA in Education. She currently teaches World History at Eastside College Preparatory School in Palo Alto, and founded The Hidden Road Initiative, which provides educational and leadership opportunities to underprivileged students in Armenia. Morgan Blum Schneider is the Director of the Holocaust Center of JFCS. She has been an instrumental leader in the development and success of the Holocaust Center since 2005. After receiving her undergraduate degree from Clark University in history (specializing in Holocaust and genocide studies) she went on to Deakin University in Australia where she focused her Master’s thesis on the forced removal of Aboriginal children as a case of genocide. A staunch advocate for innovative and interactive Holocaust education, Morgan has published several articles on the patterns of genocide, best practices for teaching the Holocaust, and the future of Holocaust education in the post-survivor era. Sara Cohan is an educational consultant specializing in genocide education. She works with The Genocide Education Project and has worked for other human rights organizations in the past. Cohan’s background combines research, study, curriculum development, and teaching. Previously, Cohan was a high school teacher for seven years. Sandy Cohen-Wynn is a visual artist. For 21 years she taught Judaic Arts to students and their families at Congregation Emanu-El in San Francisco. An alumna of the JFCS Tauber Holocaust Education Fellowship, she continues to create workshops and installations using art as a means for learning and reflecting about the Holocaust. Jonathan Furst is an educator for the Jewish Partisan Educational Foundation. He teaches about the approximately 30,000 Jews—many of them teens—who fought back in organized, armed resistance groups as Jewish partisans during the Holocaust. Rabbi C. Michelle Greenberg is the Dean of Students at Kehillah Jewish High School where she teaches a course on the Holocaust. Rabbi Greenberg has developed programs that include service learning, teen advocacy training, international volunteer trips, and peer counseling education. She recently partnered with the Galicia Jewish Museum in Krakow, Poland to develop a Holocaust exhibit. Stevie Greenwell is a musician, educator, and facilitator. She is a JFCS Tauber Holocaust Education Fellow and designed a musical program around Ritual, Resistance, and the Holocaust. She works with schools, community choirs, nonprofits and various organizations around the Bay Area. Previously, Stevie served as the Director of Vocal Studies at Marin School of the Arts. Alexis Herr is the Associate Director of the Holocaust Center of JFCS. In her role, Alexis oversees and trains Next Generation speakers and works with survivors of modern day atrocity and genocide on our Speakers Bureau. She holds a doctorate in Holocaust Studies from Clark University and is the author of The Holocaust and Compensated Compliance in Italy and editor of Rwandan Genocide: The Essential Reference Guide and the forthcoming Darfur Genocide: The Essential Reference Guide. She also lectures at San Francisco State University. Allison McManis teaches World History and a year-long Holocaust and Human Behavior elective at City Arts & Tech High School in San Francisco. Allison was a recipient of the Morris Weiss Award (2016) and is a JFCS Tauber Holocaust Educator Fellow. Stephanie McGraw has been teaching and leading a seminar on the Holocaust for 17 years at The Athenian School. She also teaches classes on U.S. history and race and women’s literature. As the Dean of Students, Stephanie also weaves social justice into her daily work with teenagers. Leet Miller is a senior at Stuart Hall High School and an alumnus of the JFCS Next Chapter program. His research on architecture, art, and history resulted to a permanent art exhibit at Stuart Hall, illuminating the school’s connection with San Francisco’s Japanese-American internment history. Bob Parker has been an educator for 25 years, and is currently in his 18th year at Moreau Catholic High School in Hayward. He has been teaching Holocaust and Genocide Studies since 2000. Frank Perez teaches world history, Mexican-American history, and Ethnic Studies at San Benito High School in Hollister, where he has developed and implemented curriculum on past and present genocides. His op-eds and letters to the editor on genocide and genocide denial have been published in several publications including the New York Times. Jacqueline Regev is the Education Director at the Anti-Defamation League (ADL). She is a former classroom teacher and teacher educator with years of experience creating safe spaces for challenging conversations. Jacqueline directs ADL’s regional education initiatives including No Place for Hate® and A WORLD OF DIFFERENCE®. Jacqueline’s work engages schools in community building practices to disrupt bias and the escalation of hate. Sheri Rosenblum, Director of Development and Outreach for the Jewish Partisan Educational Foundation, holds a BA and a MA in Judaic Studies from UCLA and Brandeis University. Her thesis, Moral Dilemmas of the Judenrat, was supervised by Dr. Arnold Band, a former United States Holocaust Memorial Museum A. Savitt Fellow. An experienced educator, she enjoys teaching. Carrie J. Schroeder has authored and published textbooks and teacher resources that are used in Catholic high schools throughout the country. She is currently the Director of Educational Ministries at Our Lady of Lourdes Church in Oakland. A JFCS Tauber Holocaust Educator Fellow, Carrie has studied the Holocaust in Washington, D.C., Poland, and Israel. Michael Sepidoza Campos teaches in the Religion department of Convent & Stuart Hall High Schools, Schools of the Sacred Heart in San Francisco. As a JFCS Tauber Holocaust Education Fellow, Campos is coordinating the Morningstar Fellowship on the Japanese-American internment, which will involve taking six students to explore the geography, space, and history of Manzanar. Ilona Shechter is a Museum Teacher Fellow at the United States Holocaust Memorial Museum and an alumna of the International School of Holocaust Studies at Yad Vashem. She has traveled to Germany and Poland and studied at the sites of former concentration and extermination camps. Jack Weinstein founded the Bay Area branch of Facing History and Ourselves in 1996. As Senior Program Advisor, he designs and conducts workshops and seminars for educators and develops curriculum on genocide and human rights. Jack was a high school teacher for over 20 years. Peretz Wolf-Prusan is a Senior Educator at Lehrhaus Judaica, where he is engaged in community education for the Bay Area and an adjunct faculty member of the JFCS Holocaust Center. Previously, Peretz was a synagogue rabbi and educator, and before rabbinic school, a teacher of junior high and high school students.